We chose Kandy as our “base” for our travels across the more central parts of Sri Lanka, specifically the hill country (tea country) and the ancient cities north of Kandy. 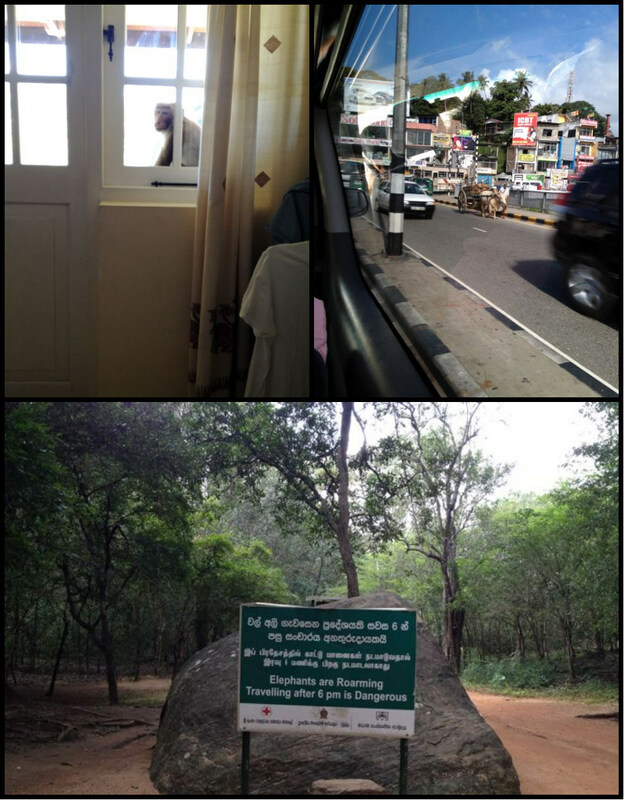 Kandy itself is an ancient city and was the capital when it was still a Kingdom. There is a lovely lake that anchors the centre of the city with houses that spiral up around it on hills–so there’s a view from almost anywhere. Inns, like the rustic Kandy Residence (with is worth calling about a traditional Sri Lankan breakfast or dinner even if you’re not staying there) have balconies that look out across the city and lake. There are warnings to never leave your window open unless you are present or monkeys will come in. In fact, they threaten to come in and make off even if you are there. Actually, they will steal the sunglasses from right on top of your head. I watched a tenacious one in a showdown with a woman carrying a large fruit in her arms. But the animals you really need to heed are the elephants. 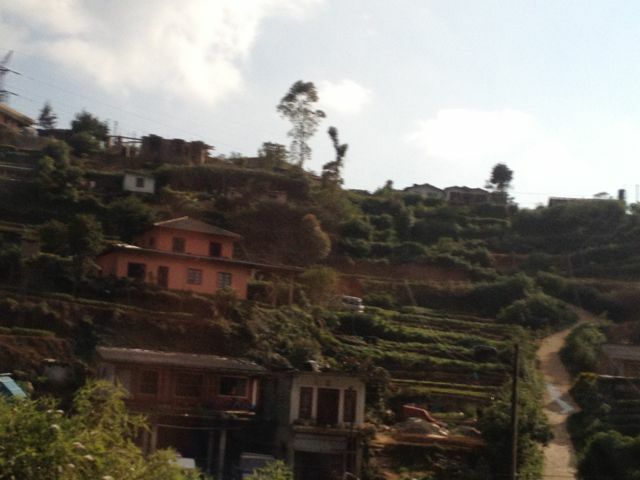 Revered in Sri Lanka, they are not happy about their paths being disrupted by development. You must stay off any roads that cut through jungles once the sun starts to set. In the day, they tend to stay cloaked in the shade of the canopy and wander around one the heat of the sun has passed. No one, no one we ever spoke to, took that lightly. They all warned, as do signs, that to come across an elephant at dusk or later is to lose. I didn’t go to Kandy in August when the much-anticipated Esala Perahera takes place but I must mention it. The Peraheras celebrate sacred relics which are carried on select, life-long trained elephants, adorned with robes and lights, through a parade where whip-crackers, skilled dancers and other artists precede it. 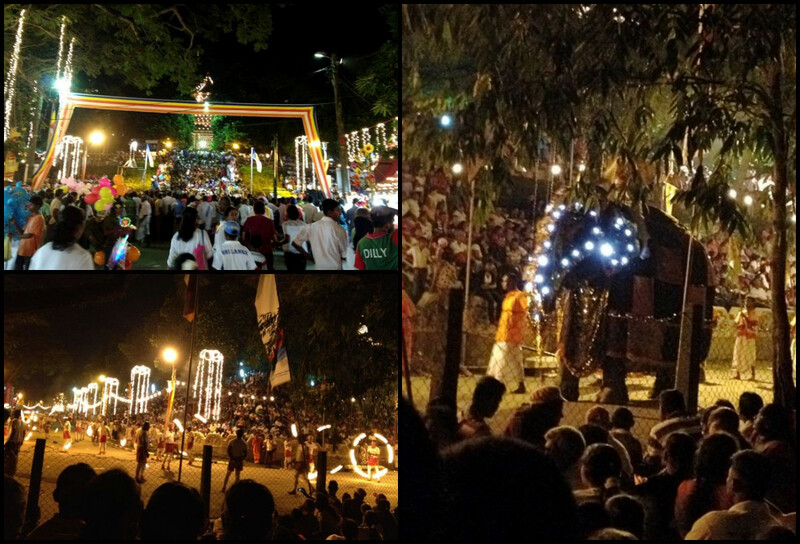 They are huge events attended by thousands–the picture above is of a Perahera we attended outside of Colombo. The one in Kandy is even more grand and more important. Staying at inns is the norm, where breakfasts spreads give you a true taste of Sri Lankan curries, breads, rice and noodles made especially for this meal. At night, the food probably doesn’t get any better than the home cooks at that same inn, but you also can’t beat a cold beer and the sunset view from the Slightly Chilled Lounge–which is much more than a lounge. The menu and food are “Sri Lankan Chinese” with fried rice and a ridiculously good chili cuttlefish which Sri Lankans expect from their Chinese restaurants. The kangkung is good too is at every restaurant in Sri Lanka that I went to (I ordered it almost everywhere I could). I was surprised that Chinese dishes like scrambled eggs with tomatoes and clay-pot eggplant were maybe the best that I’ve ever had. It gets a little chilly at night in any area of the “up-county” and the lounge is open all around so bring a sweater. NB: Alcohol is not served on Independence Day, religious and most other major holidays, which I found out the hard way when visiting the lounge. Twice! 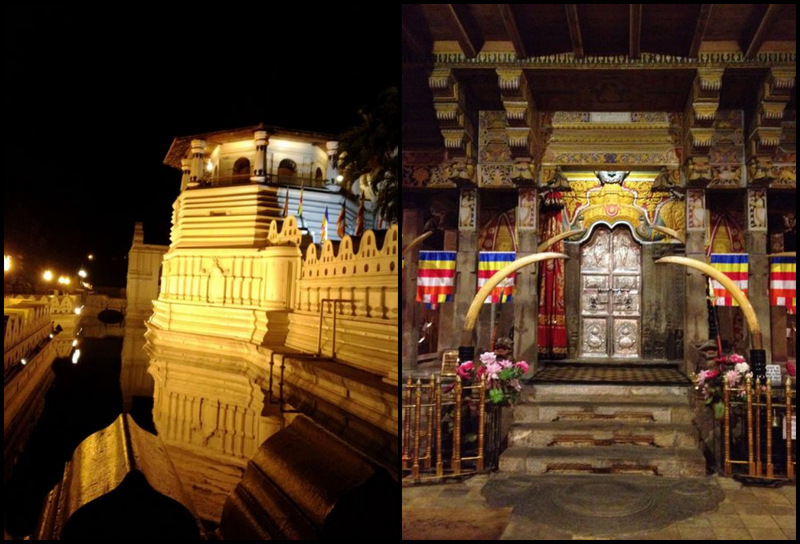 Aside from walking through the town and around the lake, a visit to the Temple of the Tooth (housing the Sacred Tooth Relic of the Buddha) is something to see, particularly at night. If you clothed in (modest) white garb and arrive during the early evening, you can pass by the front of the relic to pay respects and observe the evening pooja. When you leave, the grounds are aglow in the warm lights that’s cast up onto the spectacular architecture of the temple and surrounding moat. And opposite the temple is another concrete spectacle, well-lighted and just as spectacular by night, the Bahiravokanda Vihara Buddha Statue which sits high upon a hill and seems to watch over Kandy. 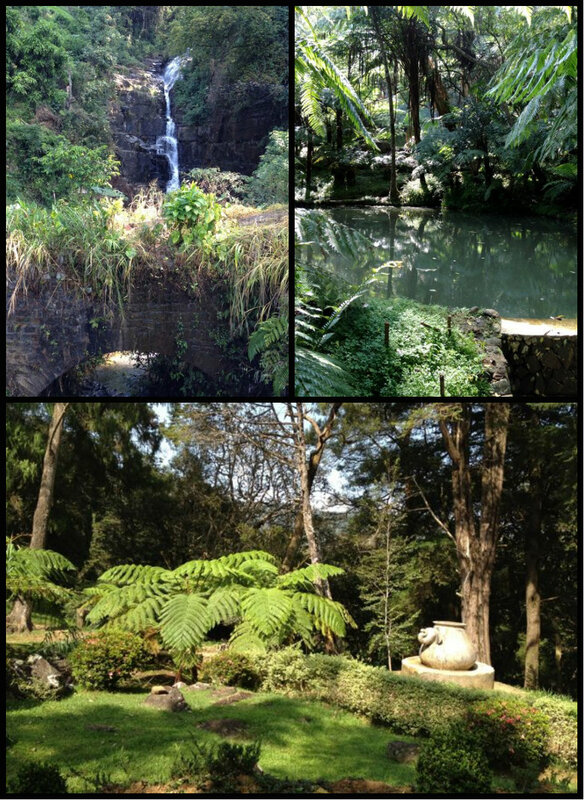 On your way to tea country, you must drop in to see the Hakgala Botanical Gardens. 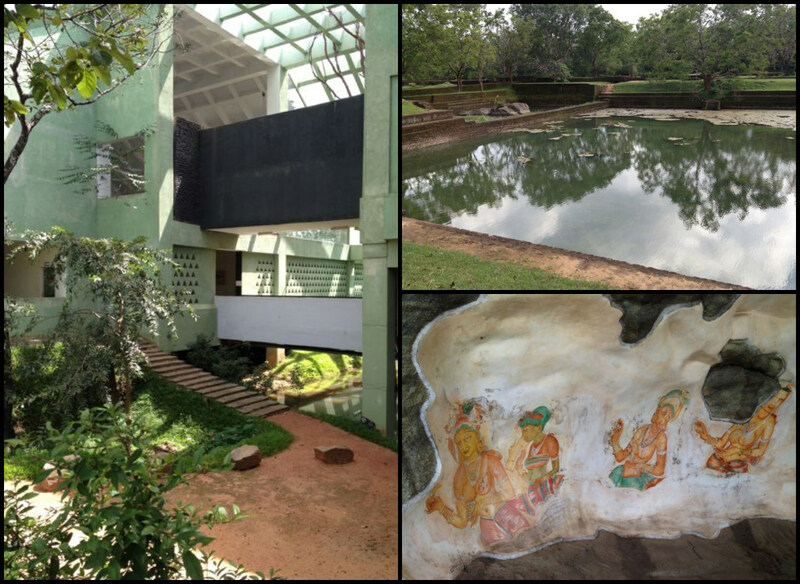 We went before the gardens were even in bloom but the terraces, ponds, brooks, canopied fern gardens and the famous herb garden that Hanuman brought over according to myth (one for which the gardens were named). 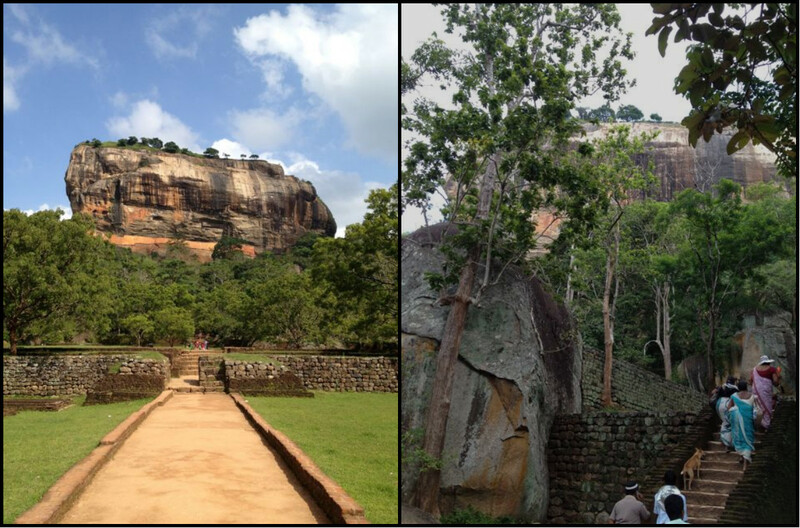 The native trees and plants of Sri Lanka are breath-taking and this garden is not to be missed if you’re in the area. 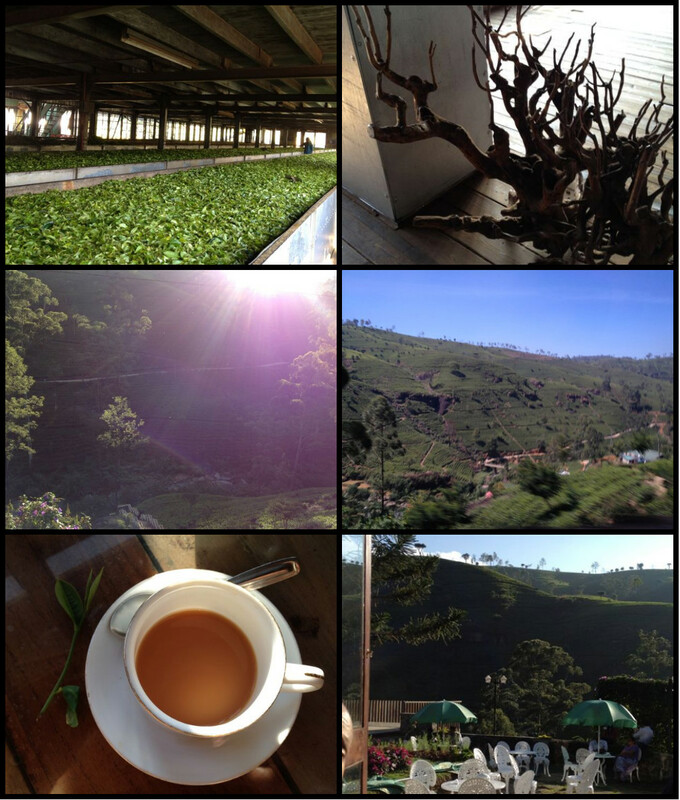 But on to the main event in Nuwara Eliya, the tea plantations. Getting this is more than half the point. Driving up, and up and up the 2000 metres into the sky is one thing. You will not believe how steep and how high you are winding up but as you go, you are awarded views to rival any you’ve ever seen in your life. At every turn the landscape and foliage changes, you see a plantation or an entire village out of sight just a twist before–and make sure you descend around 5 to see it all in pink and orange hues cast by a setting sun that hides behind and then burns bright around the mountains. There are several large plantations that offer tours. We went to one of the largest, Mackwoods Labookelle Tea Centre, where you can have a cup of tea on their patio and pretend you live in paradise. 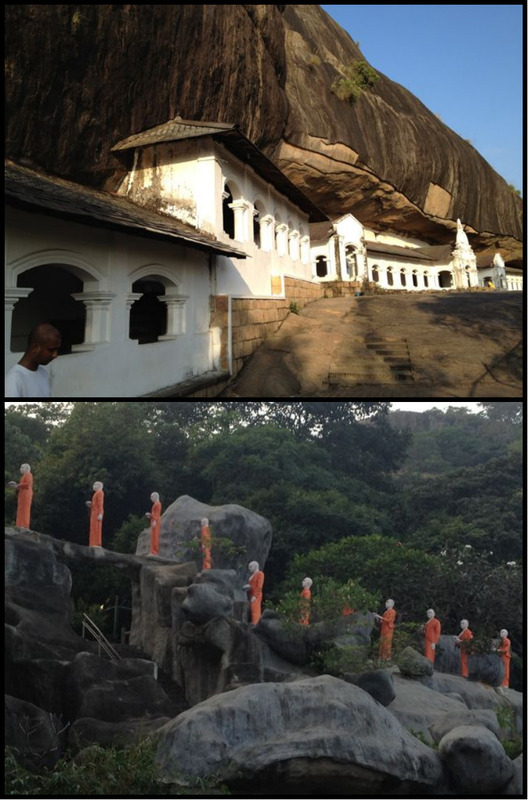 Of all of the pilgrimages you can make in Sri Lanka, climing Siripada or Adam’s Peak is the most arduous and intense. It is an important site for Buddhists, Hindus, Muslims and Christians alike (who believe the footprint at the top is that of the Buddha, Shiva, Adam or St. Thomas respectively. Young and old alike climb and mostly at night to reach the summit for sunrise. It is 2,243 metres above sea level (7,400 feet) and the clime is 5,200 steps of varying make (rock, concrete, wood), steepness and, quite frankly, levels of safety. 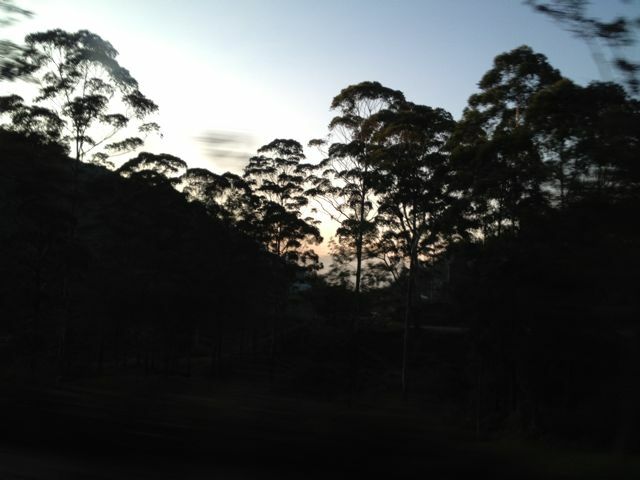 It is a cold climb at night and a very hot climb down under an inescapable sun. It is heart-stopping in its beauty and treachery. They say if you doubt yourself, the mountain will destroy you. I had several mental breakdowns and didn’t think I was going to make it yet there were grandmother’s with canes climbing alone. It’s hard and moving for all. There’s barely a dry eye at the top where everyone (thousands climb each day) rings a bell for each time they have climbed in their life. A smaller but definitely worthwhile climb is up to the Dambula Cave Temples. A lovely, though at times, steep climb, that you make by daylight up to the cave complex that has been “in continuous use for 22 centuries” and houses 157 Buddhist and Hindu statues. The caves, statues and views from the mountain are humbling, each equally intricate and rich. In the heart of Ceylon, the extraordinary site of Sigiriya, a lofty rock of reddish gneiss dominating, from a height of some 150 m, the neighbouring plateau, has been inhabited since the 3rd century BC, as attested by the graffiti which proliferate in the grottoes and the shelters of the Buddhist monks. The fame of the ‘Lion Mountain’ is, however, due to one single factor: during a short period in the 5th century AD, a sovereign established his capital there. King Kassapa I (477-95), son of Dhatusena, only came to power after he had engineered the assassination of his father and had, briefly, dispossessed his brother. It’s another tricky mountain to climb but on your way, you pass through the ancient palace grounds, asymmetrical bathing pools and at the start of the journey is the Sigirya museum which is a sight to behold in itself. It was a gift from Japan and passing through it is like walking through a serene garden. Inside there are artifacts and replicas of the famous frescoes on the cave walls of the Sigirya rock. You can see Sigirya and Dambula in a day but it’s best to stay somewhere overnight (like the quite luxurious, hard to leave, Cinnamon Lodge in Habarana) so you can visit Polonnaruwa fresh. 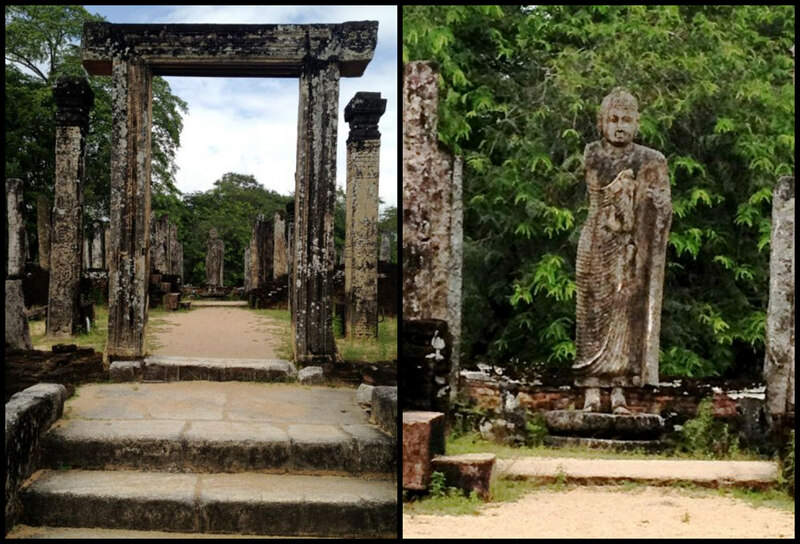 The ancient city of gardens and temple ruins from the 12th and 13th century are in remarkable condition after being excavated. It’s mind-blowing to walk barefoot among them just as they always were. 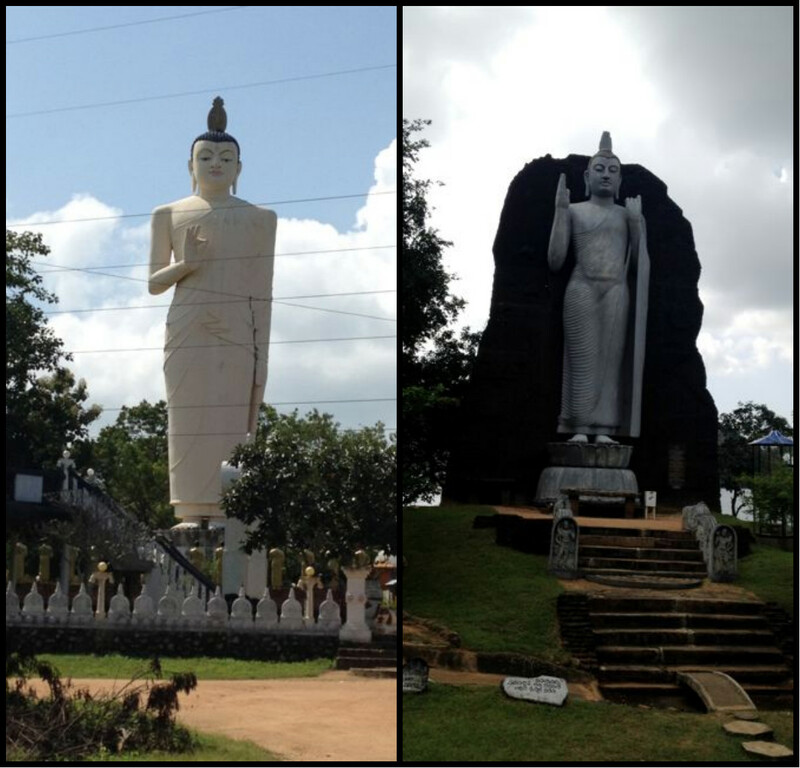 In and out of the ancient cities and all along your travels, you will pass immense statues, temples large and small, huts, green villages, jungles, rice paddy fields, cashew crops, animals… you could spends weeks just exploring the ancient cities, hill country, Kandy and the smaller towns around it, and if you’re lucky enough to, why wouldn’t you. One note about all of these and other sites–the fee for tourists to enter is nominal but it is still 300x more than the local pay for entry. Shoes must be removed to enter most religious sites and modest attire is often required to set foot within the most sacred parts, although you can often tour the grounds. A long scarf to tie around your waist will do in most cases for men and women in shorter shorts–is is hot by day so it’s a good idea to dress for the weather and bring something with which to cover up. If you want a guide, have the gatekeepers and ticket takers point out ones they know and trust. If you do not want a guide–and you will be besieged with offers in most cases–then politely and persistently decline (even small talk will unintentionally encourage).